This Level 3 Award is part of our OAL accredited Occupational Health and Safety qualifications. 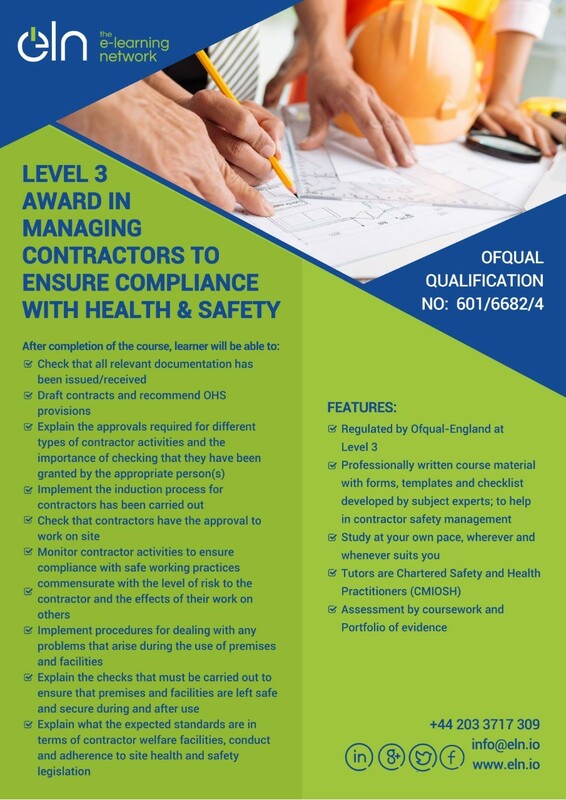 It is suitable for you if want to simply learn about or if you are responsible for compliance in Health and Safety while managing contractors on site. It includes topics such as: monitoring attendance, conducting on-site health & safety requirements by observing entry, exit and on-site movements. It is also about reporting on issues which are outside your own area of responsibility or competence. Our Level 3 Award in Managing Contractor Health and Safety has no pre-requirements. You need to have workplace evidence of risk assessments, reports etc. However, if these are not available, we can accept theory, essay style assignments only. However, if you do not have access to work experience your personal tutor will be able to guide you through a series of theory based assignments. How does ELN conduct the delivery and assessment? The Level 3 Award in Managing Contractor H&S is delivered completely online and is assessed online as well through typed assignments and work-based evidence. Our qualified, subject expert, personal tutor will be available to you throughout your studies to assess and support you and help you complete your Diploma in H&S. We do offer group discounts and classroom-based courses for groups of 5 or more candidates, contact us right now to get a quote. There are no formal entry requirements for learners selecting this qualification. Learner must be 18 years of age and access to workplace is recommended. Assessment is done portfolio-based through work-based evidence. Theortical essay type assignments are also included. If you do not have access to current work as a H&S officer then please choose the theory unit only option on the right.